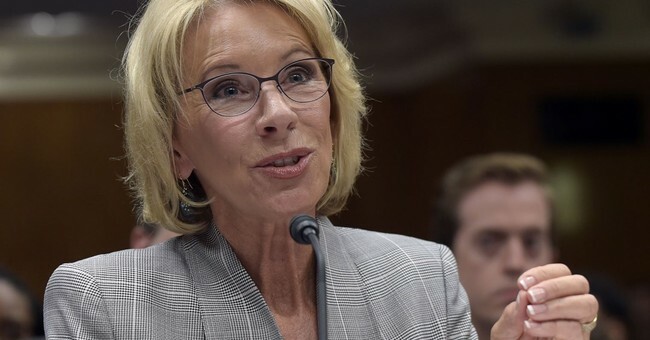 More than 160 Democrats came together to present Department of Education Secretary Betsy DeVos with a letter demanding she prevents schools from using federal funding to purchase firearms or provide firearms training for teachers and school faculty. We write to express opposition to any forthcoming action by the U.S. Department of Education (Department) to allow funds authorized under Title IV-A of the Elementary and Secondary Education Act (ESEA), as amended by the Every Student Succeeds Act (ESSA), for the purchase of firearms or firearms training for school staff. Reporting by the New York Times and other outlets indicate that you have been asked by State and school district leaders to allow federal funds to be used for these purposes. Based on the program's authorizing statute, recent Congressional action, and precedent, you have the authority to deny such use of funds. Therefore, we urge you to swiftly exercise your authority to clarify to State and Local Education Agencies that ESEA Title IV-A funds may not be used to arm teachers and other school staff. In December of 2015, Congress passed the Every Student Succeeds Act (ESSA) with strong bi-partisan support to help ensure educational opportunity for all students. Central to achieving that goal is implementation of the law's newly-authorized formula grant program, the Student Support and Academic Enrichment Grant Program (Title IV-A) . Title IV-A is intended to provide school districts with supplemental federal resources to ensure low-income students have access to improved educational opportunities through programming and services to improve school climate, increase access to a well-rounded education beyond tested subjects, and bolster the availability of cutting edge technology to support student learning. Using program funds to put more guns in schools is counter to the program's statutory purpose and Congressional intent. How can low-income students have access to educational opportunities if they are afraid to go to school? Because school funds are based on property taxes, poor kids are more likely to have a poor education and guess what that means? They need the federal government to step in and provide them with things that students in rich neighborhoods, like Beverly Hills, are able to afford. Kids in rich neighborhoods can afford private security and private schools. Wouldn't arming teachers at a public high school actually be achieving Congress' goal of "leveling the playing field?" Title IV-A affords local leaders the flexibility to tailor investments to meet local needs; however, in writing and enacting ESSA, Congress never contemplated, and thus never intended, that such flexibility would allow for the procurement of firearms. Congress denounced the presence of firearms in schools in ESEA section 4102(5)(B), which defines the term "drug and violence prevention" as a program that fosters "the creation and maintenance of a school environment free of weapons." Thus, any use of funds to purchase weapons not only violates intent, but it also clearly contradicts the clear reading of the statute. A school free of weapons means students are free of weapons, not faculty, staff and school resource officers. If that was the case, law enforcement wouldn't be on high school campuses. They would be simple security guards the district hired. Having trained faculty and staff is not the same as a student sneaking a gun onto campus. Equating the two is just asinine. Congressional opposition to the implementation of federal funds for guns in schools is not open to interpretation. In authorizing the STOP School Violence Act in the aftermath of the Parkland, FL school shooting, Congress acted to prohibit program funds from being used for the purchase of firearms or firearms training. Subsection (a) of section 2706 of Division S of Fiscal Year 2018 Consolidated Appropriations Act states: "(a) NO FUNDS TO PROVIDE FIREARMS OR TRAINING – No amounts provided as a grant under this part may be used for the provision to any person of a firearm or training in the use of a firearm." Furthermore, it is the longstanding position of the federal government that using federal funds to purchase firearms and ammunition as related to school safety are not allowed. For example, The Homeland Security Grant Program authorizing statute allows funds to be used broadly for not only "enhancing school preparedness" but also "any other appropriate activity" as determined by the Federal Emergency Management Agency. Yet despite the flexible authorizing statute, both 2017 program guidance and the Fiscal Year (FY) 2018 notice of funding opportunity issued by the Trump administration maintained longstanding policy that prohibits the purchase of firearms and ammunition as allowable program expenses. Students and school staff deserve a learning environment that is safe, welcoming, and conducive to quality instruction and student learning. Arming teachers would not only jeopardize student and staff health and safety, but also run counter to Congressional intent, precedent, and common sense. We urge you to clearly and unequivocally disallow the arming of teachers using ESEA funds intended to improve equity of educational opportunity. Please respond to this letter by providing written confirmation of your intent to issue, before the end of current fiscal year, formal guidance that excludes the purchase of firearms or firearms training as allowable expenditures of ESEA Title IV-A program funds on or before Friday, August 31st 2018. These Democrats say there's no "common sense" in arming teachers. We've tried their way before. We've tried reminding students to say something if they see something suspicious. But what keeps happening? School shootings. And what do we keep doing? That's right...absolutely. NOTHING. Isn't that the very definition of insanity? Doing the same thing repeatedly and expecting a different result? Not only does this group of legislators lack any common sense but they were very assumptive in their position. Making the assumption that DeVos — an appointee of a president who has strong ties to the gun community — would come out against arming teachers is just flat out stupid. Face it, Democrats. We've done things your way. We've put up signs that say schools are a "gun free zone." We've told kids to tell teachers or parents if they are suspicious of anyone and everyone. And gun control laws keep being crammed down our throat. But not a thing has changed. Maybe it's time to admit, Liberals. You all don't know how to deal with mass shootings. It's time to stop calling for "solutions" that are proven to be utter failures and start looking at what the pro-gun community has been saying. After all, it's not about being right. It's about being safe. And protecting our greatest asset: America's future.